Gor Mahia will relentlessly pursue their goal of finishing the 2015 season unbeaten and winning a quadruple of titles. In this regard, players must still compete for first team slots and the team will not field weakened teams for the sake of giving other players experience. This according to Gor Mahia technical bench member Frank Ouna. While Gor Mahia pursue their lfty goals, they will have to contend with injuries to certain players. But Gor Mahia has a strong enough squad such that when a player is out with an injury, others can step forward and effectively take their place. “Injuries have tampered with us a little, because currently we do not have Abouba Sibomana, Goddfrey Walusimbi and Collins ‘Gattuso’ Okoth, but we have those, who can effectively fill their slots. We still have crucial matches coming up and we still need to maintain our unbeaten record. So we cannot afford to field a weaker team, which I do not believe exists here.” continued Ouna. Indeed the competition for places has seen many players step up their game in recent matches including George Odhiambo “Blackberry” and Ernest Wendo. However one player whose form has been consistently impressive each time he stepped on the field in recent weeks is Innocent Wafula. Not much was thought of him when he was signed in January. But he has since proven doubters wrong with his industriousness and pacy run down the flanks that cause opposing defenses all kinds of nightmares. And he has found himself among the goals, most crucially when he scored against SoNy Sugar to clinch the league title. Wafula is effusive in his praise for coach Frank Nuttall whom he credits with his success. “I thank the coach because he has helped me settle in and improve as a player,” he said. The match against Western Stima which was scheduled for this Thursday has been moved to September 4. The match pitting AFC and Sofapaka was also postponed because the Kenya Police are busy providing security of the ongoing International Trade Fair. This means Gor Mahia do not have another KPL fixture until October 15. Gor Mahia who had been banned from using the legendary Camp Toyoyo, formerly known as Jericho Sports grounds have now had the ban lifted. The team was turned away after they arrived at the stadium on Tuesday following fracas that erupted on Sunday during a Champions Cup final match between Gor Mahia Youth and Terror Squad. The organizers initially accused Gor Mahia fans of causing the fracas. But a closer look suggests that local estate youth were mostly to blame. They have been allowed to train after we sorted out the misunderstanding. They wanted some assurances which we have given,” Ngala told goal.com. Ngala also blamed organisers of the champions’ tournament for not providing enough security. “There was a lot at stake. Perhaps the match should not have been played at Camp Toyoyo but rather taken to a stadium with a perimeter fence to enhance security.” he continued. It was Tusker who eliminated Gor Mahia at the same stage during the 2014 KPL Top 8. Tusker beat Gor Mahia 1-0 in Meru before drawing 1-1 in the return leg with Gor Mahia’s goal coming via Rama Salim. Gor Mahia has shown that despite winning the league with several matches in hand, the players are not resting on their laurels. They want the accomplishment of an unbeaten season and they are each still eager to prove their worth. A classic example of this is Ernest Wendo who has not featured much in the starting line-up. But when he got his chance on Sunday against Muhoroni, he acquited himself well as did George Odhiambo “Blackberry” when he came on in the 82nd minute. Both played well against Muhoroni Youth on Sunday and both will be eager to showcase their talents in the semi-finals. Should Gor Mahia beat Tusker, they will proceed to the final to play the winner of the matchup between Sofapaka and SoNu Sugar. The final will be on November 1 with winner collecting Ksh 1 million. Gor Mahia continued their irrepressible march towards a quadruple title season when they dispatched Muhoroni Youth in clinical fashion. Gor Mahia came into this match expecting strong resistance from a Muhoroni Youth side that had not lost in their last 12 games. Some pundits even called this match “the clash of the unbeatens”. In the first 10 minutes it really did look like the Kisumu county lads were going to give as good as they received. 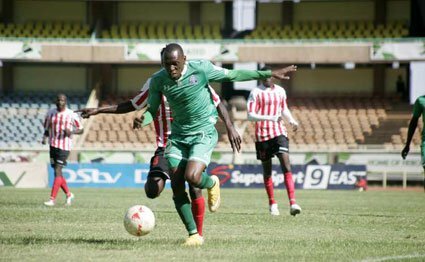 Wycliffe Ochomo, a former Gor Mahia player who prides himself in scoring against his old teams was marked out of the game. His attempt at a free-kick fell way short. But after the first 10 minutes, Gor Mahia gained the upper hand. Innocent Wafula had two attempts blocked by Shikhalo . Meddie Kagere, Michael Olunga and Ali Abondo all had well taken attempts at goal. Muhoroni Youth will thank their goalkeeper Farouk Shikhalo as he made several excellent saves in the first half. In the second half, Gor Mahia put further pressure on the accelerator pedal as they pushed for a goal. Innocent Wafula almost put Gor Mahia ahead in the 55th minute. But his attempt went inches wide. Meddie Kagere finally broke the deadlock when he beat two Muhoroni defenders before placing the ball beyond Shikhalo in the Muhoroni goal. Tenn minutes later, Michael Olunga put Gor Mahia further ahead when he picked up the ball on the left flank after being put through by Ernest Wendo then calmly beat Farouk Shikhalo. In the 78th minute, Muhoroni Youth were awarded a penalty after Eric Ochieng was adjudged to have handled the ball in the penalty box. But veteran Franklin Osama’s attempt was saved by Boniface Oluoch. In the 89th minute, substitute George Odhiambo “Blackberry” sealed the score with a goal the reminded many of his glory years in 2010. He dribbled past several Muhoroni Youth players before finishing with powerful shot. The win against what was anticipated to be strong opposition shows that the Gor Mahia core of players are still hungry even after having won the league. It also shows that KPL teams simply have no answer for what is a very clinical Gor Mahia side. Gor Mahia : 23. Bonface Oluoch -GK, 5. Musa Mohamed (cpt), 14. Karim Nizigiyimana, 20. Ernest Wendo, 29. Innocent Wafula, 17. Eric Ochieng, 18. Harun Shakava, 22. Meddie Kagere, 30. Ali Abondo, 19. Michael Olunga, 10. Khalid Aucho. Muhoroni Youth : 39. Farouk Shikhalo, 7. Yusuf Mohammed, 23. Wycliffe Nyangechi, 24. Franklyne Osama, 14.Paul Michuka, 2. Paul Mboya, 10. Abbas Akinyemi (Cpt), 26. George Mandela, 29. Francis Ochola, 30. Mike Khaduli, 12. Wycliffe Ochomo. Mulee noted that Gor Mahia had the best full backs in Sibomana and Nizigiymana. He points out that though Olunga was outstanding , Gor Mahia were not dependent on one player because Kagere, Abondo , Aucho and others all stepped up their game. He goes on to say that Gor Mahia could do well in continental football next season if they can find a way to keep their squad intact. This is a tall order. Gor Mahia goalkeeper’s coach Mathew Ottamax Owino is set to become the first official to leave the club this season due to unpaid allowances. Though Gor Mahia have managed to keep the player salaries current, it has been a different story with club officials. Even coach Frank Nuttall has often gone unpaid. Matthew Ottamax Owino is a disgruntled man. Despite the league champions keeping a record 15 clean sheets in the league this campaign, the Gor Mahia goalkeeping coach is yet to receive his salary for the past one, two, three and four months. In fact he has lost count. Alongside Frank Nuttall,Tom Ogweno, Bobby Ogolla and Frank Ouna they have formed a formidable team behind the team that has delivered the third title to the Green Army in record breaking fashion. For all the success he has enjoyed since he returned to the club where he shaped his goalkeeping skills as a youngster, Ottamax believes it is high time he quit following months of empty promises. The situation has become unbearable for the father of one who admits that he is struggling to make end meets at home. -This is causing tension even at home. My family has reached a point where they cannot understand because I leave the house very early in the morning and they wonder what I go to do because I return with nothing.My daughter has been in and out of school due to fees and it reall pains me that I cannot provide for her yet I am working, said Ottamax. -My life is football. It has always been football. I think I have built my profile and I am ready to leave if I get a better offer elsewhere, concluded the former international. It is intriguing to see whether Ottamax, who travelled with the team to Kisumu for their Top 8 match against Muhoroni Youth, will attract would be suitors as topflight clubs regroup at the close of the season. 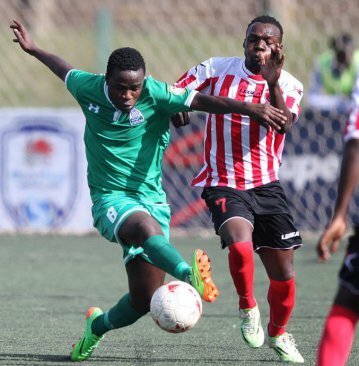 Having won the 2015 Supercup and 2015 Kenya Premier League title and having made it through to the next round of the GoTV shield, Gor Mahia will start their campaign for a fourth title in 2015 when they take on Muhoroni Youth this weekend. For Gor Mahia aside from maintaining their unbeaten run, it is a chance for certain players who have been absent for long stretches to prove their worth. Jerim Onyango or Wycliff Juma should see action between the sticks. George Odhiambo “Blackberry” was resurgent in 2014 but has spent a lot of time on the bench until recently when he has started to work his way back into the starting line-up. “I am happy to be able to play wherever I can and to contribute to the team winning. That is the most important thing for me and not personal glory,” he said to supersport.com. And Blackberry is well aware of the threat posed by Muhoroni Youth. “The game will be tough and we know we cannot underestimate them at all,” he said. “They will know that we are favourites and they will have nothing to lose so they will be very dangerous. The season so far has been very good and we know that we have to continue in the same vein and we will be in a good place come the end of the season.” he continued. Gor Mahia has played in every single KPL top 8 tournament since the tournament’s inauguration in 2011. In 2011, Gor Mahia opened by beating Mathare United 2-0 then lost to Ulinzi in the semis drawing the first leg 0-0 before losing the second leg 0-1. Gor Mahia last won this trophy in 2012 when they beat Ulinzi Stars 2-0 in extra time with goals from Rama Salim and Itubu Imbem. In the first round they had received a walkover against AFC Leopards who opted out of the KPL Top 8 in order to focus on their league campaign. In the next round, Gor Mahia beat Tusker 1-0 in the first leg and 3-0 in the second leg. Goals came from Rama Salim, Edwin Lavatsa and a memorable goal from Moses Odhiambo “Dube” who lobbed the out of position Tusker goalkeeper. In the 2013 opening round, Gor Mahia beat Ulinzi 4-2 on penalties after the game had ended scoreless. In the semis they lost 0-1 to Tusker in the first leg and drew the second leg 0-0. 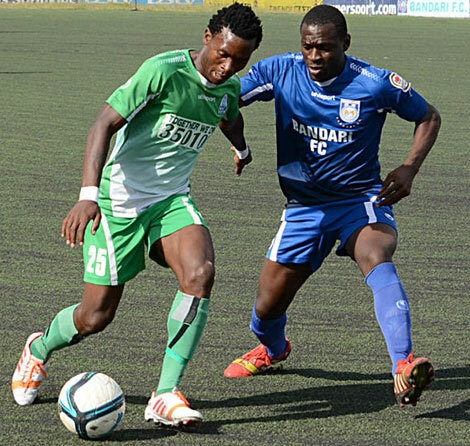 In 2014 Gor Mahia opened with a 2-1 win over Thika United thanks to goals from George Odhiambo and Dan Sserunkuma. In the semis, they played Tusker. They lost the first leg 0-1 in Meru, before drawing the second leg 1-1 thanks to a goal from Rama Salim. After having dispatched lower tier side Langata Gremio in the opening round and KPL side Ushuru in the 2nd round, Gor Mahia will once again face minnows from a lower league in Palos FC of Kisumu. However Gor Mahia will have to be wary of Palos. It was in Kisumu last season that Gor Mahia met their waterloo in the GoTV shield, surprisingly losing to GFC 105 on spot kicks. Palos made it to the next round after having beatenPalos edged out Talanta 4-2 on post-match penalties. They are a 3rd tier team eager to make the great leap to the big league in a few years. Essentially they are what Muhoroni Youth was 5 years ago. And they are probably the next incarnation of great community teams that have emerged from the City of Kisumu, following in the path of legendary teams like Kisumu Hotstars, Kisumu All Stars, Kisumu Posta and Kisumu Blackstars, all of which were feeder clubs for Gor Mahia. Many Gor Mahia legends of the past came from these teams. Players like Allan Thigo, Bobby Ogolla, Charles Otieno, John Okello Zangi, Anthony Ndolo, Tom Odhiambo, John Chore and many others. With that in mind, Kisumu Palos players will be keen to impress. They will play the game of their lives. “For most of our players, this is the biggest game of their career. The fact that Gor Mahia are enjoying top form makes it even more difficult. But it is a huge motivation to us and we want to prove a point,” said their coach Paul Ogai to the Standard. Ogai insisted that anything can happen in the match. “We have watched Gor Mahia’s matches and realised that the attack is their biggest strength. At the same time, however, they tend to leave their back exposed. If we get organised, then we can do it.” he continued. Palos FC Club plays a lead role in encouraging and nurturing its next generation of football players in Kisumu County Miwani sub location Nyangeta zone by providing opportunities for talented senior and junior players to compete at the highest level, including in district, provincial and national youth tournaments. Gor Mahia showed that despite having won the league, they have not lost their sharpness nor their hunger. They beat a hard fighting Ushuru side 3-2 at Nyayo stadium on Sunday. 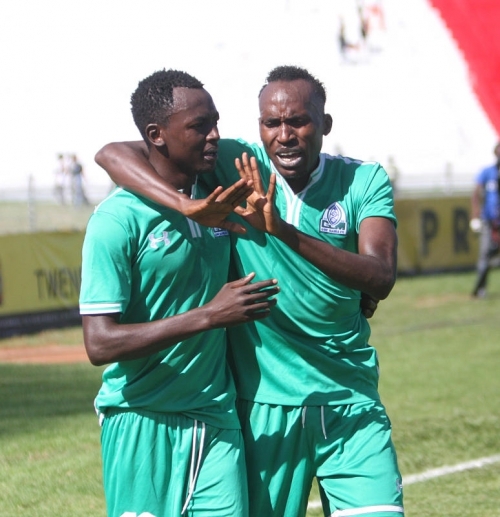 A brace from Rwandese marksman Meddie Kagere plus a rare goal from Collins Okoth “Gattuso” gave Gor Mahia a well deserved win of Ushuru in a GoTV shield round of 32 encounter. It was defensive midfielder “Gattuso” who opened the scoring as early as the 5th minute when he deflected a cross from hardworking Innocent Wafula. The taxmen leveled matters in the 8th minute via Mohamed Hassan who scored from close range. Gor Mahia then dominated the proceedings with the lion’s share of possession. The taxmen defended doggedly. That is until Karim Nizigiyimana sent one of his inch perfect crosses exactly to where Kagere wanted it. Kagere made no mistake heading home. Those two have connected several times for a goal and it came as no surprise this time. Gor Mahia went into the breather leading 2-1. 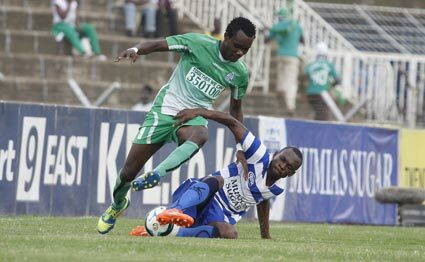 Gor Mahia started the second half as they had finished the first , keeping the Ushuru defence busy. Michael Olunga in particular was a constant thorn in Ushuru’s flesh. However it was Ushuru who scored. And once again it was Mohamed Hassan who evaded the Gor Mahia defence to score. Coach Frank Nuttall admits it was not easy keeping the team together during the 2015 season. Though the team put on a splendid and united display each time they stepped on the field, things were not always rosy behind the scenes. Among other things, the players often boycotted training to protest unpaid salaries. “We played under very difficult circumstances. Sometimes, I used to plead with the players to resume training after boycotting. I contemplated throwing in the towel in support of my players but considered many factors and had to tone down considering the club had no sponsor. I had no particular person to blame since I saw how the executive played a great role of striving to get money to sustain the team,” said Nuttall after the match. Indeed Chairman Rachier must be given a lot of credit for keeping the team afloat. Nuttall further praised Kogalo fans aka the green army for supporting the team both financially and on the terraces. Whereas Nuttall has praised the players and the club officials, he probably deserves a lot more praise. Under Nuttall, the team has shown a creativity and variety in their play that has befuddled and confused opposing teams who simply had no answer. Gone is the “patia Sserunkuma” tactic that was prevalent in 2014. The Gor Mahia of 2015 was unpredictable and could attack teams in a variety of ways. It comes as no surprise that Kogalo have scored an incredible 54 goals with four matches left and have two players among the top four scorers in the league. Nuttall was able to identify each players strengths and harness those strengths to the maximum.